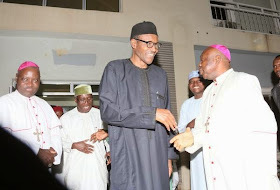 Apparently it is not only president Goodluck Jonathan that is meeting with Church leaders, the presidential candidates of the All Progressive Congress, Buhari and Osinbajo are doing same. 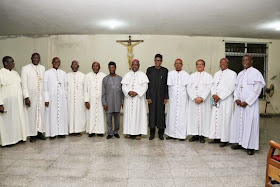 Major General Buhari, his running mate, Osinbajo and members of the APC campaign council met with Catholic Bishops in Abuja on Tuesday. Speaking during the meeting, Buhari said he had no personal religious agenda and as a practicing Muslim, he doesn’t share the views of any extremist group. For me, the issue of religion was, and should always, be a matter of personal conviction. This personal conviction approach to religion has defined my work and interactions all my life, including my tenure in office as military Head of State. The religion of all those I worked with was never a factor in their progress or in what happened to them. All that mattered then, and should still matter today, are competence, integrity and readiness to be fair to all. I was recently informed that we had a balanced cabinet with key positions such as Finance, Energy and Defence occupied by Christians. In addition, 11 of the 19 governors I appointed were Christians. My most memorable recollections of subordinate service was under Christian bosses, the finest our country had then, and among the most respected today. Indeed one of the best appraisals I received in the course of my military career was from General T.Y Danjuma. What every Government should care about: Government has no business preferring one religion to the other. The role of government is to protect lives and properties of citizens and to respect and protect their constitutional rights. One critical freedom that every government must strive to protect is the liberty for citizens to exercise their respective faiths, Christians and Muslims or others, in a lawful manner without fear or hindrance and to prosecute those who use religion as an excuse to destroy homes, schools and places of worship. When governments fail in that duty, they must then assist in the rebuilding of structures including destroyed places of worship and giving full restitution for lost property. We, Nigerians, are a religious people, and the burning of places of worship constitutes one of the vilest forms of abomination to all those who believe in God. It is the duty of governments to protect this important sensitivity. Let me state this categorically, that I, MuhammaduBuhari, as an individual, and as president of this great country by the grace of God, given the opportunity to serve, have no personal religious agenda. And I will not entertain, consider or promote the religious agenda of anyone. I will not condone any initiative that seeks to promote one religion over the other. Neither I, nor my party, or any member of my team has any desire or plan to Islamize or Christianize Nigeria or support anyone with such intention. Although I am a practicing Muslim, and I have been so all my life, I have never belonged to, nor shared the views of, any extremist group. I am not even a cleric. I believe that religion is personal and private. Many of the people close to me are not of my religion. My cook and driver for 20 years are Christians, Most of my bodyguards are Christians. Some were killed while protecting me in the terrorist attack on my convoy in Kaduna. If I have not Islamized these people who serve under me, how will I Islamize the likes of Chief John Odigie-Oyegun, Ogbonnaya Onu, Governors RochasOkorocha, Kayode Fayemi, Rotimi Amaechi or Professor Yemi Osinbajo who is a senior advocate of Nigeria and a pastor? Or how will I Islamize Nigeria? Our constitution, which in many respects, is similar to the American constitution does not permit a state religion. The Sharia identified in the constitution is almost synonymous with customary law. It is only applicable in matters of personal status such as marriage, divorce and inheritance. This has been the case since the 1979 constitution. Just as no one can make any customary or any other religious law the law of Nigeria, so Sharia cannot therefore be the law of Nigeria. My record is evidence of this strongly held belief. Before my tenure, the deadly and violent extremist radical sect, Maitasine carried out terrorist activities in the north, especially Kano; When it erupted again in Yola, during my tenure, I took direct command, and personally led the successful effort to eradicate the threat to our country. Similarly, when some Chadian insurgents attempted to occupy Nigerian territory, I led the military confrontation that eliminated the threat. For all purposes, we must all learn to live together as brothers and sisters, because the problems that bedevil our nation do not discriminate based on religion or ethnicity. Poverty and hunger do not know or respect religion or creed. When a bomb explodes in a market, it kills and maims without regard for religion or ethnicity. The millions of the unemployed youth of our country cut across all tribes and religions. Wicked propagandists continue to spread vicious lies about me for political gain, including claiming that I once asked Muslims not to vote for Christians. This must be the height of absurdity. How could I ever say that, when whoever voted for me would be voting for the Christian running with me on the same ticket? And how could I ever say that of Christians when my own holy book, the Qur’an, tells me that in the entire world those that are nearest in love to me are those who believe in Jesus Christ [AS]? I ask, who, intending to win any election, ever does that? 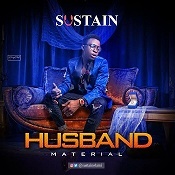 How can I choose southern Christian running mates [Chuba Okadigbo of blessed memory, Pastor Tunde Bakare and Pastor YemiOsinbajo] and with them by my side make such silly utterances? We must reject those who propagate hatred, ethnicity, divisiveness, sectionalism or seek to manipulate our religious differences in such cynical fashion. On our part, we will remain undeterred: our commitment is to bring about change in the way we live and think and work in this nation; and our goal is to ensure a decent existence for all. And, by the Grace of God, that is what we will do—we will remain true to our commitment and we will achieve our goal." he said.